Street parking is available on Poyntz Avenue and its cross streets. If street parking is not available, then there is a public, free City of Manhattan parking lot located one block north of (behind) Harry's on the corner of 5th street and Humboldt. 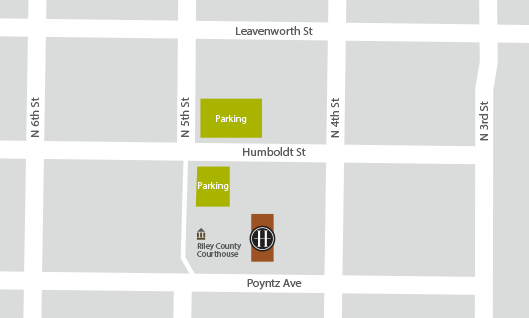 Once parked, walk across Humboldt Street and past the Riley County Courthouse toward Harry's. There is also free public parking available after hours at the Riley County Courthouse. You will find our side entrance into Harry's on the west side of the Historic Wareham Hotel building (which is the brick building with white stone balconies). We are located in Downtown Manhattan in the historic Wareham Hotel building, near the Wareham Opera House. Cross streets are Poyntz Avenue and 4th Street. From Topeka/Kansas City: Take I-70 W to Exit 313/KS-177 N. Exit and merge onto KS-177 N. Continue for 8.5 miles. As you come into town, continue across the bridge. KS-177 becomes Pierre Street. Continue to intersection of Pierre Street and 4th Street. Turn right onto 4th Street. Continue two blocks north to Poyntz Avenue. Turn left onto Poyntz Avenue. The restaurant is on the north side of the street. Look for the Harry's sign on the historic building's front awning. Street parking is available. From Junction City/Western Kansas: Take I-70 E to Exit 303/ KS-18 E. Exit and at top of exit ramp, turn north (left) toward Ogden/Manhattan. Continue 13 miles on KS-18 E, which turns into Ft. Riley Boulevard as you come into town. Turn north (left) on Juliette Avenue. Turn east (right) on Poyntz Avenue and continue 0.4 miles. The restaurant is on the north side of the street. Look for the Harry's sign on the historic building's front awning. Street parking is available. From Wichita Airport: Get on US-400 E/US-54 E from S Mid Continent Rd. Take I-235 N, I-135 N, US-50 E, US-77 N and KS-18 E to S Juliette Ave in Manhattan. Continue on S Juliette Ave. Turn east (right) on Poyntz Avenue and continue 0.4 miles. The restaurant is on the north side of the street. Look for the Harry's sign on the historic building's front awning. Street parking is available. From Manhattan Airport: Get on KS-18 in Ogden from Skyway Dr. Exit and at top of exit ramp, turn north (left) toward Ogden/Manhattan. Continue 13 miles on KS-18 E, which turns into Ft. Riley Boulevard as you come into town. Turn north (left) on Juliette Avenue. Turn east (right) on Poyntz Avenue and continue 0.4 miles. The restaurant is on the north side of the street. Look for the Harry's sign on the historic building's front awning. Street parking is available. Restaurant and Menu Description – Located in the Historic Wareham Hotel, Harry's is known as Manhattan's premier fine dining establishment. The restaurant is best known for its classic-contemporary cuisine and gracious service. The American menu features hand-cut steaks and fresh seafood, along with a nice selection of from-scratch specialty menu items. The Wareham Hotel atmosphere provides diners with a piece of history while offering a warm memorable elegance. Whether a romantic dinner for two, business meeting, or a special occasion with friends and family, Harry's will provide you with an unforgettable experience. Hours of Operation – Dining room is open for dinner at 5:00 PM with seating until 9:00 PM on Monday-Thursday and until 10:00 PM on Friday and Saturday. Bar and Cocktail Area (high top window seating looking onto Poyntz Avenue) is open from 4:00 PM-10:30 PM Monday-Thursday and until 12 AM or later Friday and Saturday. Closed Sunday. Reservations – Reservations are accepted, but not required. A portion of the restaurant is available for walk-in guests. All seating in the Cocktail Area (the front window looking onto Poyntz Avenue) is open seating, as is the Bar. Full menu service is available in the Cocktail and Bar Areas. Reservations are recommended for parties of five or more. Reservations can be made online or by calling the restaurant at 785.537.1300. Walk-ins Welcome – Yes, please do visit us without a reservation! Normally we are able to accommodate diners without a wait, unless it is a very busy night or special event. If there is a wait, then we will take your name, communicate a timeframe, and you are welcome to relax in the cocktail area until your table is ready. Reservations are recommended for parties of 5 or more. Dress Code – We want you to be comfortable. We do not have a dress code policy. Some guests wear business suits while others wear jeans and a nice shirt. Coming right from a KSU sporting event? Come as you are! Gift Cards – Give the gift of a Harry's experience! Stop in to purchase a gift card at our Bar on Monday-Saturday from 11 am until evening close. Or, purchase a gift card online. Credit Cards – We accept Visa, Mastercard, Discover and American Express. Private Dining – Harry's offers private dining spaces with four unique dining rooms that will accommodate groups of 10 to 75 guests. Please call the restaurant for more details at 785.537.1300.